The Scientific Journal «Bulletin of the Kyiv National University of Technologies and Design» (Visnyk Kyivskogo natsionalnogo universitetu tekhnologij ta dizajnu) is the professional Journal with original papers focusing on scientific and technical subjects of theoretical and practical investigations, developments in production processes, machinery, treatment, dyeing, finishing, testing and use in relation to all aspects of textiles. Professional scientific journal «Bulletin of the Kyiv National University of Technologies and Design» (hereinafter referred to as the «Bulletin of КNUТD») is Legal successor in title to scientific journal «Higher Education News. Light Industry Technologies», which was launched on March 1958 (the USSR) by Kyiv Technological Institute of Light Industry (before 1999) and it was widely known among the former USSR and Eastern Europe. Bulletin continues to maintain the best practices of the best traditional publishers of «Higher Education News. Light Industry Technologies».The Scientific Journal «Bulletin of КNUТD» is professional Journal to provide individuals in the industry with articles regarding science, new technology and best practices which were still not published and have a strong theoretical and practical significance. ISSN: 1813-6796 (Print), 2617-9105 (Online). The state registration of print media is: Certificate КВ №19330–9130 ПР, dated on 8 Aug. 2012. Attestation: cat. B, №1412 dated 18.12.18. 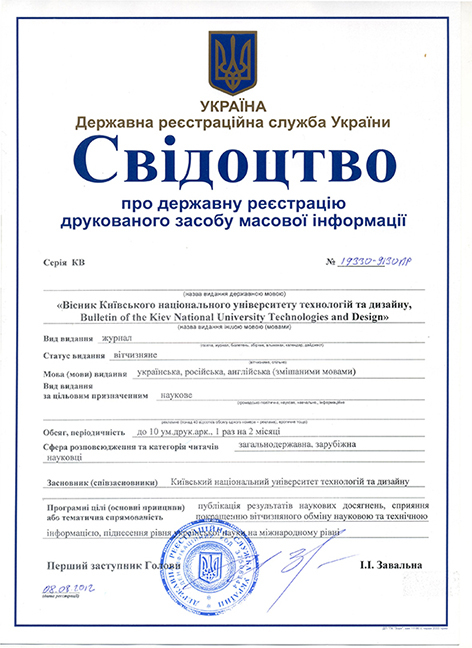 License for publishing activity is ДК № 993, originating date 24.07.2002. Periodicity: Quarterly published 6 times a year in the months of February, April, June, August, October, Desember. Publication languages: Ukrainian, Russian, English. (mixed). Up to 200 pages worth. Editorial Board includes well-known professors, scientists, key opinion leaders. Editorial team consists of scientists with expertise in each of the journal’s sections. Editors draw from their research experience to curate high-quality content for the journal. Copyright and licensing: Copyright on any open access article in this journal is retained by the author(s). Authors grant «Bulletin of КNUТD» a license to publish the article and identify itself as the original publisher. Authors also grant any third party the right to use the article freely as long as its integrity is maintained and its original authors, citation details and publisher are identified. Manuscripts will not be published until each author has completed a copyright transfer agreement. The journal «Bulletin of КNUТD» publishes research papers on terms: Creative Commons Attribution License International CC-BY. Open Access Policy: This journal is practicing a Policy of immediate open access to published content, supporting the principles of the free flow of scientific information and global knowledge sharing for the common social progress. The current issue and full text archive of this journal is available at ‘Archive’ page. «Bulletin of КNUТD» is a peer-reviewed journal and indexed/abstracted in the scientific databases.